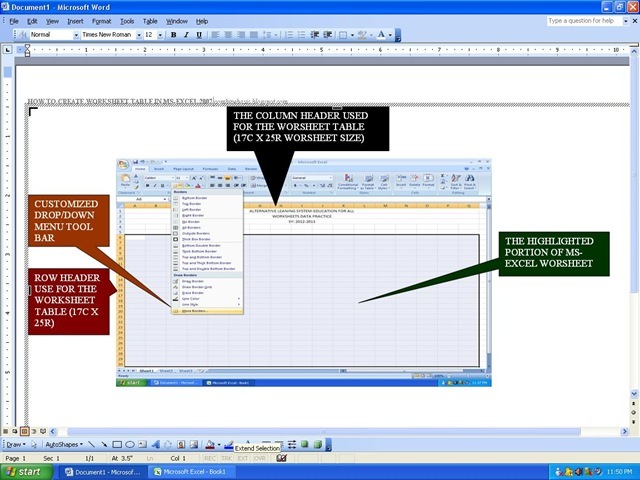 One thing that we should know is how to create a worksheet table using the latest MS-Excel 2007 version.Although, we can perform logical calculation even if we don't create a borders of worksheets to form the worksheet table.It is depend to the requirements of the data,but it just very necessary to create the worksheet table. Actually, other said that using the latest MS-Excel 2007 version is very difficult to use.But actually its just a matter of knowledge and familiarizing the User Interface(UI).But for me,this latest version is now simple.Compared to the old version, the MS-EXCEL 97 and 2003. 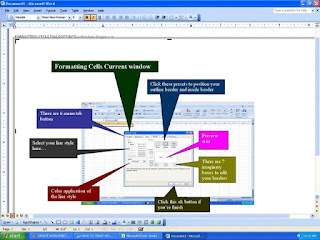 So, I will let you to learn and understand using this post.So that you can have your best idea and can be familiarized the routine of the menu toolbar and the dialogue box of the of the formatting cells. 3. But before you start to highlights,just type first the worksheet title.The worksheet title must be type in A1, so that you can align it using the merge and center of the worksheet. 4. Highlight the worksheet according to your specified size.Use the namebox to count the number of columns and rows displayed in name box once you drag your mouse.Practice this key combinations using the keyboard in highlighting your worksheet. 1. Position your worksheet cell below the worksheet title. 2. Start highlighting by holding shift key then press right arrow key to reach your number of columns you need. 3. Then press down arrow key to reach the number of rows you need in your worksheet. (Note: Hold always the shift key until you finish your highlight). 5. Once you finish highlight,you are ready to click the dialogue box for the border of the worksheet table. 7. Then click the more borders under the customized drop down menu toolbar. 12. Click OK command button. 13. Now you will see the borders of your worksheet table. 14. Merge and center the worksheet title according to the size of your worksheet. You cannot merge cell with multiple data, like for example the worksheet title from A1 to A2 it will join the two cell with one worksheet title. You can't delete a merge cell when other cell is also merge it will cluttered the entire worksheets.